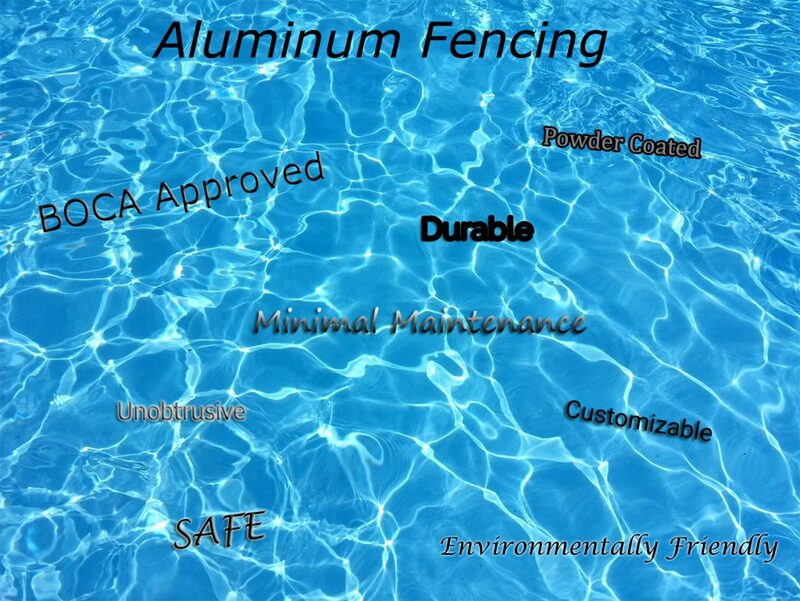 The aluminum fence has been purchased and installation is beginning but first you must plan where to put your gate within the fence line. We can help! The first step after you have decided where to place the gate is to start by digging the holes for the aluminum posts for your gate. As you are digging the holes you must make sure they are wider and deeper than the holes that have been previously dug for standard posts for the line, end, and corner. 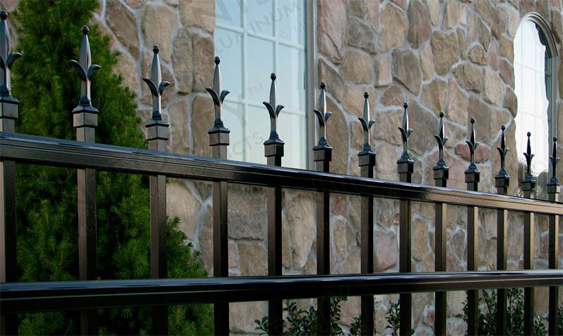 Wider, deeper holes are needed for aluminum gate posts as they will be under heavy usage. A bigger hole will mean that more concrete can be used when securing the post itself. When sizing the width of the hole needed for your gate be sure to make plenty of room on all sides of the post for concrete. The depth of the hole needs to take into consideration a number of things including the frost line, the post length, the height of the fence, and the width of the gate. Living in an area where a freeze can occur the hole for the gate post should be dug deeper than the frost line. Having the concrete below the frost line will prevent the footers from cracking over time. Concrete must be installed at the bottom of the hole as well as around the four sides of the aluminum gate post. Once the first hole has been dug it is time to move on to the second hole. The placement of the second hole will be solely dependent on the width of the gate. Aluminum gates are meant to be opened and closed. A gate that is four feet has a gate frame of only forty-six and a half inches, the inside measurement, post to post will be forty-eight inches. This gives room for the installation of hinges and latches. Next comes the placement of the gate posts and the addition of the concrete. Concrete should be added to the bottom of the hole before the placement of the post. 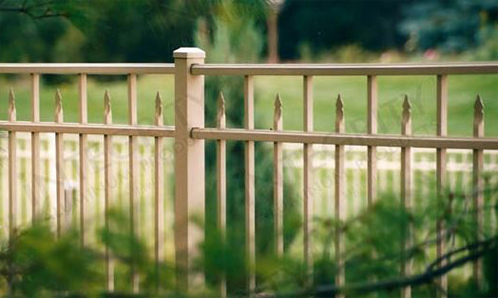 This helps to create a strong bond between the concrete and the aluminum gate post. It is important to keep your tape measurer available so that you can make sure your measurements are accurate throughout the installation of the posts and walkway gate. Once the post distance is achieved and the posts are leveled it is now time to slowly shovel in more concrete. This process should be done with extreme care to prevent the movement of the gate post. Concrete should fill the hole up until you have reached about four to six inches from the top of the hole. On top of the concrete you will add in a final layer of dirt which is packed tightly around the post to create a sturdy base for your gate. Again, throughout this process it is crucial that you maintain proper measurements and that the posts remain level. The concrete should be allowed to completely set up and dry before the final step of hanging the aluminum gate and the installation of the hardware. The final step of aluminum gate installation is to determine the direction in which the gate will swing. Outward swinging gates will need hardware to be installed on the outside face of the fence line. Vice versa for gates that will be swinging inward. Hinges will be first installed on the frame of the gate. In order for even weight distribution measure from the top and bottom of the gate for an even distance for installation of the hardware. Once the gate hinges are attached to the gate frame it is time to anchor the gate to the posts. This is a two-person job, one person to pick up the gate and hold it to the post and the other to fasten it down. Lastly install the latch and there you have it, your aluminum gate will be installed! From walkways to driveways, a gate can transform the entire look of the landscape while adding a layer of security. Aluminum estate gates alter the aesthetics of your home. With curb appeal being an important factor in the way your home is viewed by outsiders, enhancements that not only add beauty but also security can make a big difference. 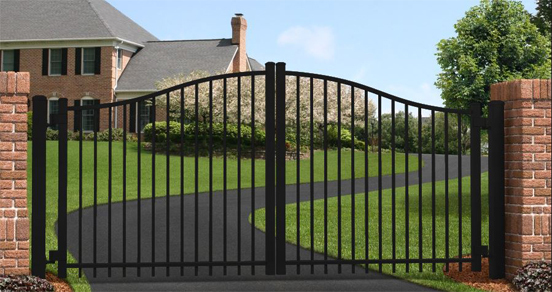 Driveway gates are commonly installed either to large columns on either side of the drive or to heavy duty aluminum posts that are purchased in conjunction with the gate. Driveway gates can be installed together or separate of perimeter fencing. The design is truly customizable to that of what each individual user desires. For some homeowners, their property is lined with wooded acreage that makes a fence unnecessary where as others have wide open yards that they are looking to completely secure. 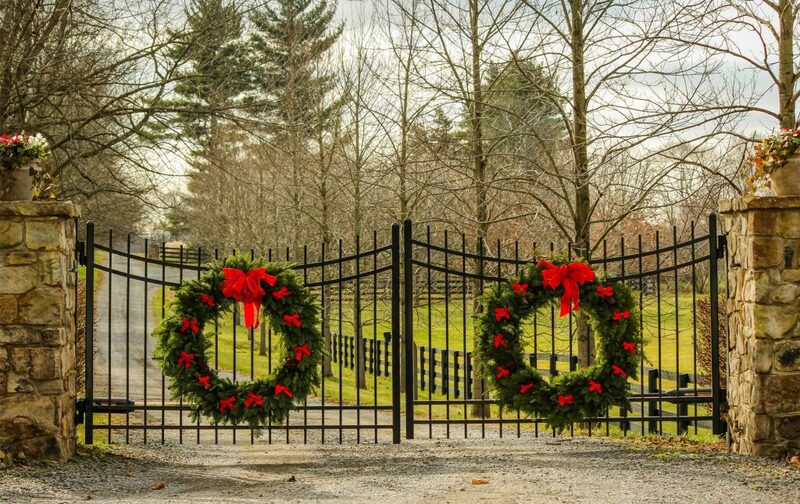 Before ordering it is important to have a general understanding of what you hope to accomplish with the installation of an estate driveway gate. Not all entry gates are grand in scale. An aluminum entry gate that compliments your home and space is what is most important. Some entryways are small in scale and a large driveway gate may be aesthetically overwhelming. 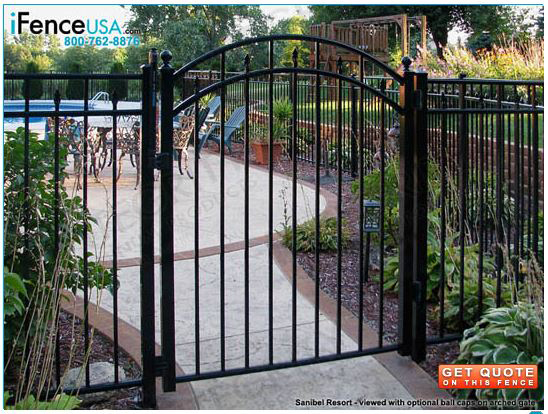 Choose an entry gate that fits your space. The gate should first and foremost be realistic for your situation and needs. There are a variety of options to choose from at iFenceUSA for even the smallest of driveways. Although for most smaller driveways a single gate is ideal, some homeowners desire the look and function of a double gate. It is important that once the gate is installed it is functional and that vehicles of all sizes can still access the home. Remember that large delivery trucks will still need to make their way up your drive on occasion. The goal is not to make your small driveway smaller with the installation of a gate but to enhance and secure the existing space. What happens when you have the opposite issue and your driveway is extra wide? Believe it or not iFenceUSA has an aluminum driveway gate that will fit any size or shape driveway or entrance that exists. Custom gates are our specialty and can come in any of the 18 styles we offer, with an arch, without an arch, with or without ornamental metal options, you name it and we can more often than not make it happen. The most important factor when ordering a driveway gate, small or large, is to take proper measurements. There are a number of guides online at our website that will help you properly measure for the gate you desire. The first measurement that is needed is between the two stationary posts (or columns) that the new gate will be attached to. It is important not to include the measurement of the posts, only the space between the posts is needed. The estate gate that you choose to install is totally dependent on the type of property you have, your exact need, and the image you hope to communicate. When it comes to designing a gate or fence for that matter, your options are endless with aluminum. 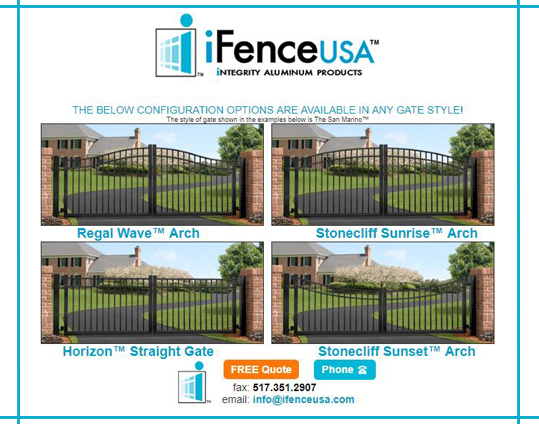 The team at iFenceUSA can help you achieve a secure, eye-catching, operational aluminum entry gate for your driveway or walkway.